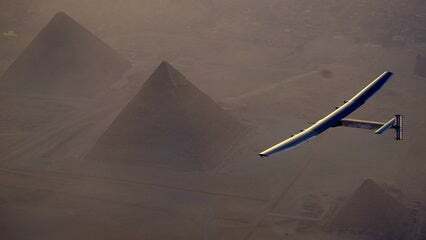 The aircraft swept over the pyramids before landing at Cairo International Airport at just after 7 a.m. local time this morning. It's now about 3,000 kilometers (1,800 miles) away from Abu Dhabi, where it began its journey in March 2015. Solar Impulse 2 was designed to run entirely on solar power, generated by hundreds of thin panels that cover the upper side of its wings and its body. It can carry a single pilot and theoretically stay in the air forever, but its human cargo necessitates the need to land. Typically, the pilot can only take 20-minute naps during the course of each leg, which take several days and nights, so most flights have taken two or three days. The most recent from Spain to Egypt took two days and two nights. For the pilots, who stopped in Silicon Valley on their way around the world, the flight is about much more than breaking a record. They are keen to demonstrate what's possible with alternative energy sources and promote the use of solar power. 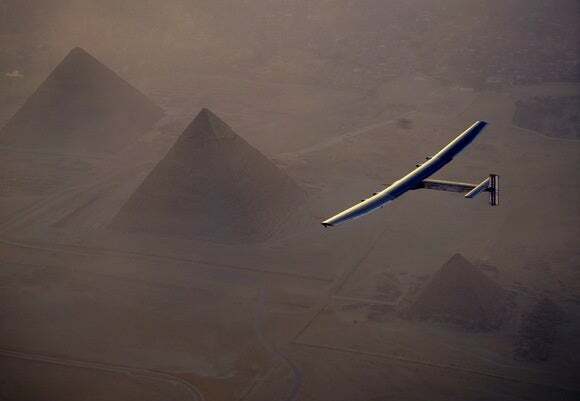 With its limitation on passengers and slow pace of flight, Solar Impulse 2 might not be the future of passenger aviation, but it has succeeded in demonstrating that solar power alone is capable of supporting such an impressive flight.